We love the image because its says so much about who we are today. Everyone has a cell phone and everyone takes selfies. 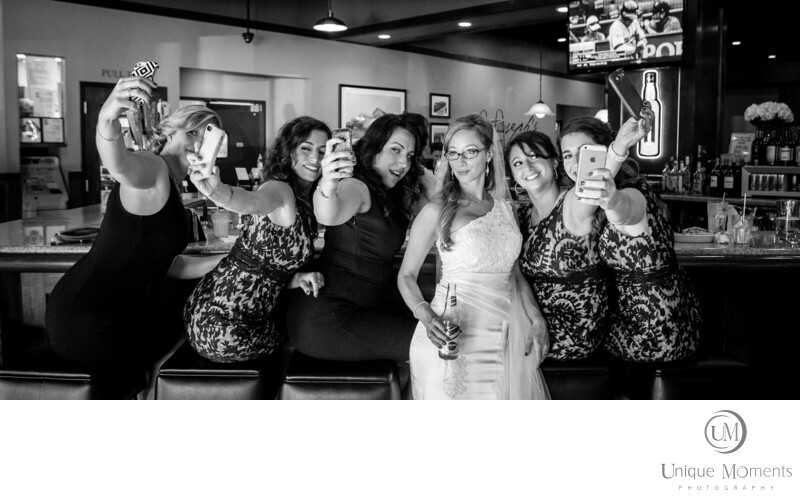 The bridal party wanted to stop at a bar for a drink before heading to the reception. As we were waiting and watching, the girls pulled out the cellphones and started taking selfies. How could we not capture this. It says everything about what we all do these days and how we interact with our friends. These are Fun images to consider especially when the girls don't know your taking the picture . Images still need to tell a story. The selfie worked well and the girls loved the image.Brides tell us they want a lot of candids. This could probably be classified as a candid. But we think it just says who we all are these days. Selfies. It was not even a word 10 yrs ago. Now its a way of life.